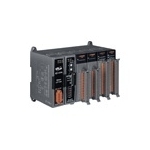 87Pn series is a powerful intelligent I/O systems series that can be easily configured to match specific mixes of analog or digital inputs or outputs. The system can be connected to the host computer using either RS485, Ethernet or USB for local or remote operation. The unit supports more than 30 I/O modules including analog input/output, digital input/output, counter/frequency I/O modules. The product is supplied with either 1,2,4 or 8 slot card cages to accommodate different combinations of plug-in I/O cards. The card cages are available with an RS485, Ethernet or USB interface. Ports are available to further expand the I/O network. A number of popular software packages support this range of products. RU-87Pn series is a remote intelligent I/O expansion unit to designed to house power and communicate with the I-87K series I/O modules over the RS-485. USB-87Pn series is a remote intelligent I/O expansion unit to designed to house power and communicate with the I-87K series I/O modules. The USB-87Pn uses an USB port to communicate with the host computer. The I-8700 series of plug in modules is a range of modules that provide extensive I/O capabilties that ca be plugged directly into any of the 87P I/O frames.